This IMHO is the most elegant way to manage applications menus. Here the menu is tucked nicely in the window manager such that its easy to have access to them without travel (to the system panel) -looking at Unity , and at the same time I can use my focus under mouse settings. I guess a picture is worth a thousand words. 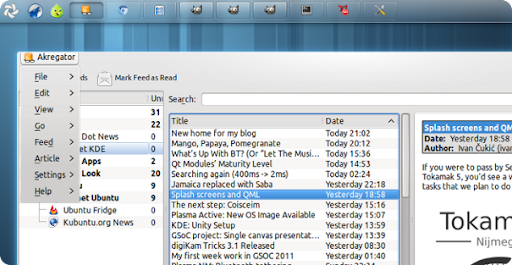 An example of KDE’s Koolness.